With so much publicity, great weather and a sell-out crowd to boot, what the Derbyshire v Yorkshire meet at Chesterfield did not need to be was a one-sided affair. And a one-sided affair it most certainly was not. In classic T20 fashion, the onus shifted from one side to the other and back again throughout, finally ending in victory for Derbyshire from the final ball. Needing four to win, after Matt Henry bowled a wide from what should have been the final ball, Tim Bresnan gave it a good push toward the rope but instead found only the hands of Luis Reece. A sign of a fantastic and evenly poised game is that it’s hard to pinpoint one thing that was positive for either side. Both sides batted well, both sides bowled decently and both sides showed some questionable fielding. In the end, it was some tidy bowling by Imran Tahir, who finished with 18-3, and some quality bowling in the penultimate over by Hardus Viljoen, removing the danger man Adam Lyth, that tipped things just slightly toward the Falcons. Winning the toss, Gary Wilson put his side in to bat first on a glorious summer’s day at Chesterfield. The pitch looked good for a bat and his side has plenty of firepower in that department. Things started slowly for the hosts, who found themselves 31-3 by the seventh over as Wantage Road hero Reece got a top edge off Rafiq and had to walk for just 9. However, a superb performance by the calm Wayne Madsen, reaching 42 off 33 balls with 6 fours in the mix, helped them reach 165-7 in their 20 overs. 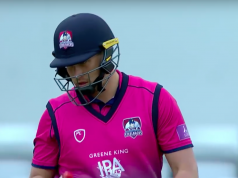 The tumbling wickets made it seem as though the Falcons were batting poorly, but there were some powerful cameos by Matt Henry, Daryn Smit and Ben Slater that suggest otherwise. Nevertheless, 165 is still slightly under par and Yorkshire may have felt this was an easy victory. Madsen had other ideas. Opening the bowling, he ripped out Tom Kohler-Cadmore’s middle stump with the second ball of the innings, giving his side cause to hope. Having been dropped by Wilson on five, Lyth had every right to go on and score big. It’s in the rule book, isn’t it? He remained from the first over through to the 19th, starting carefully but hitting the gas around the 12th. He was finally removed, caught by the safe hands of Madsen, for 68. David Willey also put in a fine performance with the bat, taking it to the Derbyshire bowlers from the first, but became one of Tahir’s scalps in the 8th over, caught at deep cover by Wilson. Despite some excellent batting by Yorkshire, the visitors never flew ahead of the run rate. But for a couple of wickets, things were evens all the way. By the final over, they needed 18 runs. Bresnan and Matthew Waite took it down to needing 5 from the final ball and the rest, as they say, is history. Derbyshire now have two wins from two in the Blast, having beaten Northamptonshire on Friday night, putting them on top of the North group table. Yorkshire, meanwhile, are third on the table with one win and one loss. Derbyshire wicketkeeper Daryn Smit, regarding the back-to back T20 wins, said: “We’ve shown at various stages of the season that we can win games but we haven’t followed it up with a second good performance, so it was really good to do it today in what was a great game of cricket. Yorkshire director of cricket Martyn Moxon added: “Last night was an outstanding performance but today we weren’t quite as fluent and it was a slightly different pitch.